Alexander Porfiryevich Borodin ( 12 November 1833, Saint Petersburg – 27 February 1887 Saint Petersburg) was a Russian Romantic composer of Georgian origin, doctor and chemist. 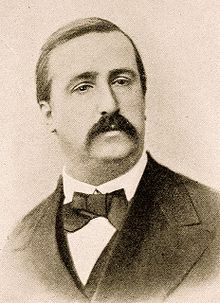 Borodin was born the illegitimate son of a Georgian noble, Luka Gedevanishvili, and a 24-year-old Russian woman, Evdokia Konstantinovna Antonova. The nobleman had him registered as the son of one of his serfs, Porfiry Borodin. As a boy he received a good education, including piano lessons. In 1850 he entered the Medical–Surgical Academy in St Petersburg and pursued a career in chemistry. On graduation he spent a year as surgeon in a military hospital, followed by three years of advanced scientific study in western Europe. In 1862 Borodin returned to St Petersburg to take up a professorial chair in chemistry at the Imperial Medical-Surgical Academy and spent the remainder of his scientific career in research, lecturing and overseeing the education of others. Eventually, he managed to establish medical courses for women (1872). He began taking lessons in composition from Mily Balakirev in 1862. He married Ekaterina Protopopova, a pianist, in 1863. Music remained a secondary vocation for Borodin outside his main career as a chemist and physician. He suffered poor health, having overcome cholera and several minor heart attacks. He died suddenly during a ball at the Academy, and was interred in Tikhvin Cemetery at the Alexander Nevsky Monastery, in Saint Petersburg. In his profession Borodin gained great respect, being particularly noted for his work on aldehydes. Borodin's musical output was sporadic and limited – he ocmposed on vacations and during his spare time. His music was never more than a hobby. Borodin's fame outside the Russian Empire was made possible during his lifetime by Franz Liszt, who arranged a performance of the Symphony No. 1 in Germany in 1880, and by the Comtesse de Mercy-Argenteau in Belgium and France. His music is noted for its strong lyricism and rich harmonies. Along with some influences from Western composers, as a member of The Five his music exudes also an undeniably Russian flavor. His passionate music and unusual harmonies proved to have a lasting influence on the younger French composers Debussy and Ravel (in homage, the latter composed in 1913 a piano piece entitled À la manière de Borodine). The evocative characteristics of Borodin's music made possible the adaptation of his compositions in the 1953 musical Kismet, by Robert Wright and George Forrest, notably in the songs Stranger in Paradise and And This Is My Beloved. In 1954, Borodin was posthumously awarded a Tony Award for this show. Borodin's music is full of romantic charm and enticing melody, and much of it also rings with the pageantry and landscape of old Russia; of onion-domed churches, richly decorated icons, and the vastness of the land. He was a member of the group of composers called The Five (or "The Mighty Handful"), who were dedicated to producing a specifically Russian kind of art music. He is best known for his symphonies, his two string quartets, In the Steppes of Central Asia and his opera Prince Igor. He was a notable advocate of women's rights and a proponent of education in Russia and was a founder of the School of Medicine for Women in St. Petersburg. Smith, Norman E. (2002). Program Notes for Band. Chicago: GIA Publications, pp. 78-79. This page was last edited on 9 September 2015, at 09:08.